Today’s post was written by Soni, horticulturalist for our Butterfly Center. She and the other employees are hard at word preparing for our upcoming Plant Sale on April 10. Got butterflies? Probably not, if your garden suffered freeze damage over the past few months. After this unusually long and cold winter, many of us have lost plants, especially species that are more tropical and not adapted to freezing temperatures. But now that winter is finally behind us, it’s time to replant! Butterfly gardeners won’t want to miss the Cockrell Butterfly Center’s Spring Plant Sale. It’s happening soon: Saturday, April 10, 2010 from 9 a.m. to 1 p.m., on the 7th level of the parking garage at the Houston Museum of Natural Science. Some of you may be seasoned butterfly gardeners, but others may be asking, “How DO you ‘garden’ for butterflies?” It’s quite simple. For a successful butterfly garden you need two types of plant: nectar and host plants. Thanks to their specialized mouthparts – a long, thin, straw-like proboscis – adult butterflies can only consume liquid food. The blooms of nectar plants produce a sugary liquid (nectar) that butterflies sip to give them the energy to fly, mate, and produce eggs. Most nectar plants have colorful flowers borne in showy clusters. 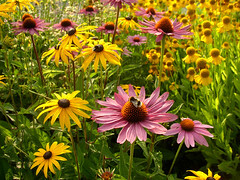 Some examples of good nectar plants for our area are Porter Weed, Echinacea (Purple Cone Flower), Zinnias, Rudbeckia (Brown and Black-eyed Susans), Monarda (Bee Balm), Lantana, Salvias, Eupatorium (Mistflower), Cuphea, Buddleia (Butterfly Bush), and Tithonia (Mexican Sunflower), among many others. In contrast to the adults, baby butterflies, aka caterpillars, have chewing mouthparts and eat leaves. Many butterflies are quite choosy in their caterpillar stage, and can only survive and grow on specific plants, which we call host plants. For example, Monarch caterpillars will only eat Asclepias (Milkweed); they cannot and will not eat anything else. Female butterflies seek out the appropriate host plants for their babies when they are laying eggs. 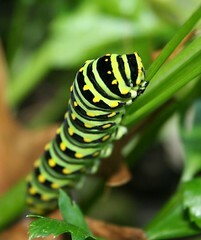 Some host plants that can be included in your butterfly garden are Asclepias (for Monarchs and Queen Butterflies); Passionvines (for Gulf Fritillaries and if you’re lucky, Zebra Longwings); Citrus and Rue (for Giant Swallowtails); Dill, Parsley, and Fennel (for Black Swallowtails); Aristolochia aka Pipevine (for Pipevine and Polydamas Swallowtails); and Cassia aka Senna (for Sulphur Butterflies). If you see caterpillars eating these plants, rejoice! 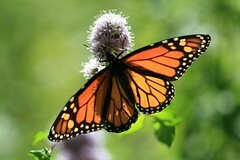 You will soon have lots of beautiful butterflies coming to your nectar plants. Some of you may think you don’t want caterpillars eating away in your garden. If so, you can avoid host plants and include only nectar plants. However, you’ll get more butterflies if you plant both. We predict that soon you’ll be treasuring every caterpillar! Many of the nectar and host plants listed above will be available at our sale. We strive to provide butterfly-attracting plants that are either native or naturalized in Texas, and that perform well in the Houston area. Our sale is also a good place to learn more about butterfly gardening. Several experts will be on hand to answer questions and to help you choose plants. Plant Sale! At the Cockrell Butterfly Center from HMNS on Vimeo. So save the date: Saturday, April 10, from 9 a.m. to 1 p.m. Come early, the plants go fast! That is NOT a Monarch caterpillar pictured in your article–it is the caterpillar of the Eastern Black Swallowtail butterfly! Talk to Nancy Grieg, or to Don Johnson, one of your volunteers, or contact me, and I can send you a picture of a Monarch caterpillar and will do so happily. I am sending this strictly in the name of factual information for those who might read this blog. Thanks for pointing that out! We did talk to Nancy and have made the correction. Thanks for reading! Is there a list of the plants on sale? are there any vines? Thanks! Previous Post Skull Slushies - What’s inside a dinosaur’s skull?